Dashiell has attended Ohlone in inclusion classrooms since kindergarten and starting in first grade, made the decision to be very open about his disability with his classmates. At the suggestion of his teacher, he told his first-grade class about how Down syndrome affects his muscles — mostly making it harder for him to do many things that come easily to other kids his age. "I can't move my muscles as well; I can't run as fast; I can't write or draw as (well)," he told the Weekly. And instead of reacting to that negatively, "People should say, 'Nice work; you're really working hard,'" he said. Dashiell also read aloud from "It's Okay to Be Different," a children's book that promotes acceptance of everything from being adopted or having special needs to eating macaroni and cheese in a bathtub. That first presentation was such a success that other teachers invited Dashiell to speak to their classrooms. That year, he spoke to some of Ohlone's second/third-grade and fourth/fifth-grade classes. He now always speaks to his own class at the beginning of the year and to others if he's asked. Now that he's older, his mother said that he'll sometimes talk "in a very simple way" about how he and others with Down syndrome have extra chromosomes — 47 instead of the usual 46. "It helps them know about me and what it's like to have Down syndrome," Dashiell said. Dashiell's mother, Kristin, said hearing him talk about having difficulty writing or speaking also helps other students who might not have disabilities but face similar academic challenges. Ohlone Resource Specialist Renee Alloy and Language Pathologist Cynthia Ehrhorn, who have both worked with Dashiell for several years and are impressed by his enthusiastic spirit, nominated him for the self-advocacy award. "He just acts as self-advocate every day by the way that he is at school," Ehrhorn said. "He doesn't let obstacles get in his way. He has this 'I can do everything everyone else can do' attitude." "He knows how to share his condition and be very proud about it," Alloy said. Dashiell's story also illustrates the benefits of inclusion classrooms for all students. "What I've noticed has changed is social awareness of other conditions and children interacting where normally they would have been isolated," she said, mentioning that Dashiell has participated in plays and other school events. "When he tells others how this has impacted him, I see them walking around on the playground arm in arm, arm over shoulder, playing games ... just being more accepting of a variety of differences that there are in our human culture. What was really nice for me to see was that having this mainstream approach was really better for all kids." And, Ehrhorn said, Dashiell's efforts have helped to create a more accepting culture at Ohlone. "I think it really shows not just kids in his class but kids at the school that we're all different, and just because you're different or you do something differently, it doesn't mean that's any less than how anyone else would do something," she said. "It's created a culture of acceptance and tolerance for differences, which I think is really neat." 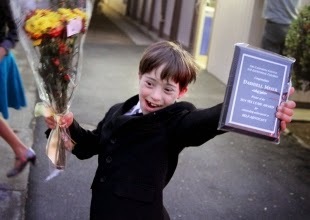 At the school board's Oct. 14 meeting, Superintendent Max McGee presented a grinning Dashiell, wearing a suit and tie, with a plaque commemorating the award, telling Dashiell that he serves as an example "for all of us." "Perhaps the most important aspect of his presentations, beyond the wonderful information that he gives, is a message of tolerance, equality and understanding," McGee said. "He reminds us we are all different, but no one is less than one another."